Video is the new document. It is accelerating communication, strengthening knowledge transfer, and empowering and engaging employees. Qumu, the world’s leading business video platform provider, helps organizations worldwide capture, manage and distribute live and on demand content with total reliability and security. Regardless of audience size, viewer device or network configuration, Qumu provides the tools you need to intelligently develop and securely distribute video and rich content with the kind of power that has a positive, bottom-line impact on your business objectives. Qumu. It’s how Business Does Video. 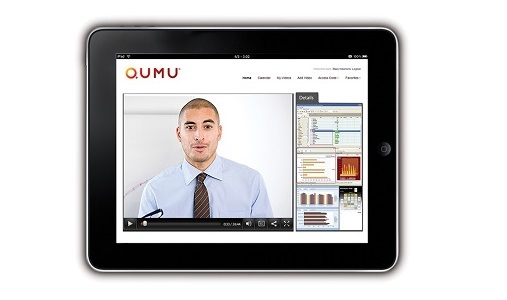 Qumu has a wide array of tools to make video work in the enterprise. Qumu Video Control Center is a single video platform for capturing video from any source, automating secure streaming and downloading, simplifying its management, and maintaining its complete control —from creation to distribution to consumption. Video Control Center offers the freedom to integrate with existing infrastructure, and the power to securely reach audiences inside and outside the firewall with confidence. Everything you need to take advantage of business video is hosted in a virtualized cloud. Qumu Cloud enables you to deploy video throughout your company almost instantaneously and with minimal impact to your internal IT infrastructure. Leveraging our Video Control Center technology through private or hybrid cloud configurations, Qumu Cloud can handle any enterprise video solution with ease. Business content can be sensitive. Qumu Signal lets you push that digital content to targeted subscribers anywhere, using virtually any desktop or mobile device. Your videos and documents reside on viewer devices, even when offline, but they’re completely encrypted so you retain control. Signal is an easy-to-use, powerful policy management and content publishing tool that lets you share everything and protect it, too.